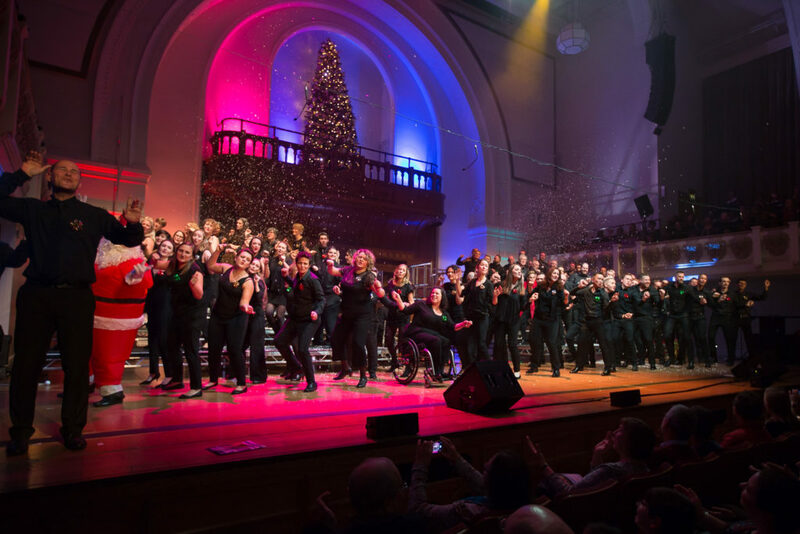 It’s been a week since we brought some Pinkie magic to the stage in our winter concert ‘Sleighing It!’. 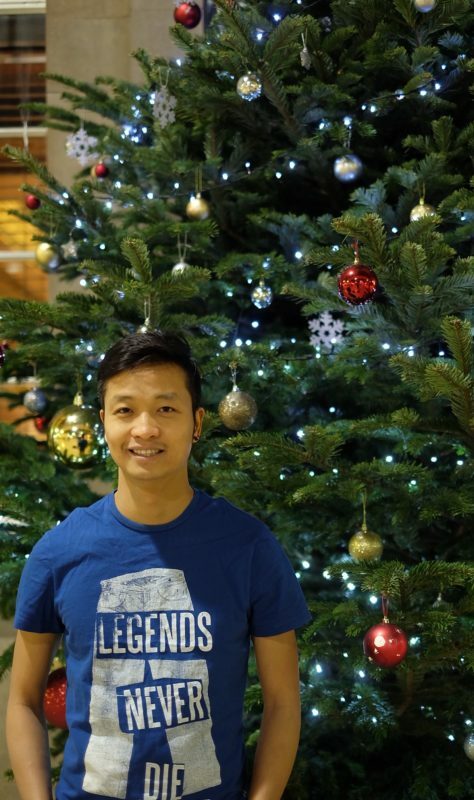 New Pink Singer Duong tells us about the concert and what the Pinkies means to him this Christmas. We started to rehearse from September. Yes, you are right, wearing T-shirts while singing carols was not a common feeling. More than 80 pinkies have worked very hard to make ‘Sleighing It!’ happen. I was amazed at the dress rehearsal when we said thank you to more than 20 pinkies who worked behind the scenes: artistic, marketing, producing, music arranging etc. What a team! The new Pinkies from this season popping their concert cherries! The closer the concert got, the more I realised how fortunate I was to be in such a beautiful community. We sing and perform together, we also share lots of beautiful moments together. I remember how sparkly Charly’s eyes were when she told me about her beautiful love journey with Ali through the Pink Singers, the touching story of Michael’s memories of when he was a little boy, a warm hug from Nicki whenever I had a bad day. The Sleighing It! concert was A-MA-ZING. 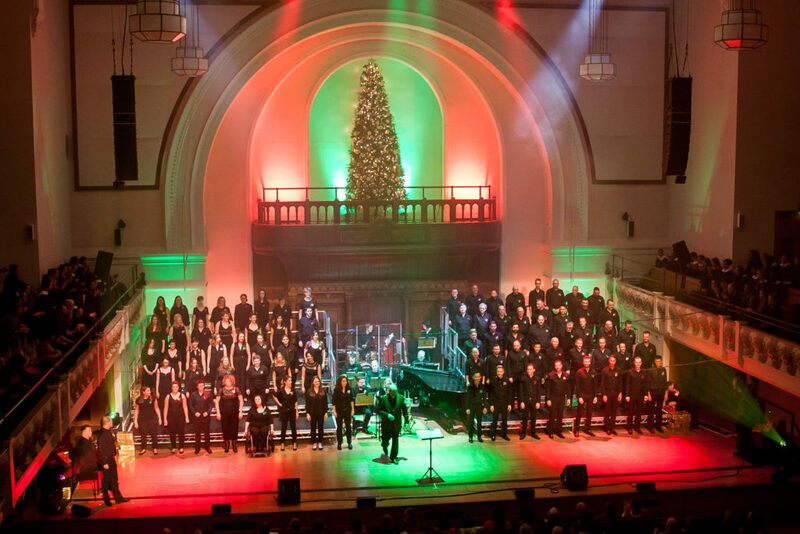 Despite the bad weather outside, Cadogan Hall was filled full of festive joy and love. My life has changed so much lately, and thanks to the Pink Singers I have fallen in love with Christmas again. I now have friendships so I don’t have to walk alone here in the UK. I wish I could list all the names of all Pinkies here to show how much I love them! Next year, I will be moving to London from Sheffield. When the choir found out that I will be taking over Sam’s room in Hester’s house (the resident Pinkie landlady! ), they said “you don’t expect the Pink Singers will take over your life, do you?” I smiled and replied “I’d be happy for it to”. Lots of love to everyone and Merry Christmas to you all. Author multimediaPosted on December 15, 2018 January 8, 2019 Categories Blog Page, Events PageTags past eventsLeave a comment on Sleighing It! 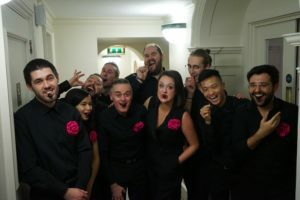 In September 2018, the Pinkies were approached by Hogan Lovells who are a global legal practice to perform at their Citizenship Review event called ‘The World We Want’. 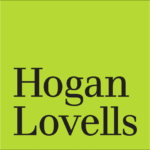 Hogan Lovells have a strong commitment to LGBT+ rights and the wider community and their event demonstrated the incredible work they’ve been doing to break down barriers and highlighted the work of their charity partners in areas of social concern. We joined a host of other performers in exploring the theme of identity and through actor portrayals of suffragettes/suffragists, mothers whose daughters were taken to Magdalene laundries and asylum seekers on the Texas/Mexico border. We closed the event on a high celebrating the change we can be in the world by singing This is Me. A tinsel-tastic, jingle-belling, Christmas-cracking show. 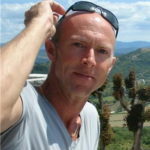 Featuring fantastic arrangements of your favourite festive songs, plus some unexpected treats from around the world. All presented with the panache and style that the Pink Singers are famous for. There are gifts for everyone including the magic of the bells, Santa and his elves, plus a Christmas character who is rather more curmudgeonly! Our special guests this year are the award-winning Burntwood Chamber Choir. Girls from the Burntwood School in Tooting have sung at every major concert hall in London, recorded and given concerts with the Royal Philharmonic Orchestra, and made film scores at Abbey Road and Pinewood Studios. Bring your friends and family and enjoy some uplifting music to kick-off your festive fun. Senior citizens, students, disabled and unemployed: 10% reduction off top four prices. Author multimediaPosted on September 13, 2018 January 8, 2019 Categories Blog PageTags concerts, past events, winterLeave a comment on Sleighing It! 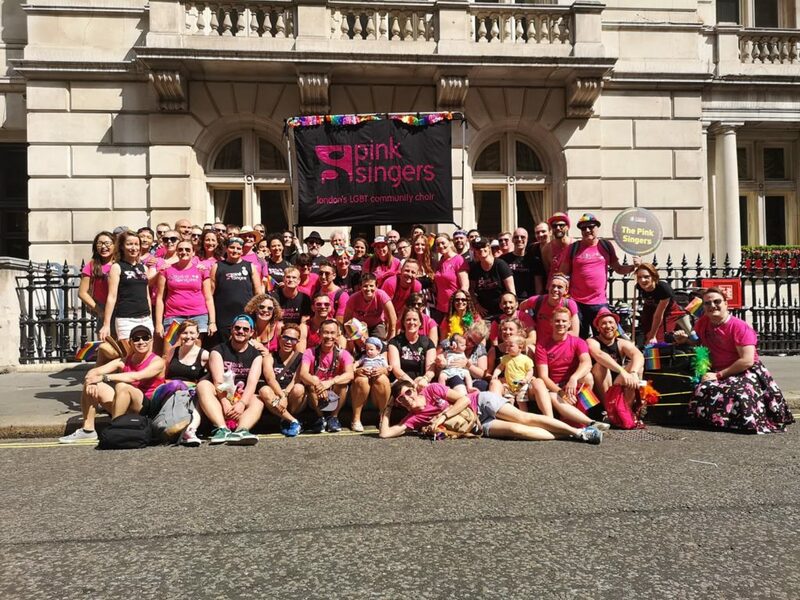 On 7 June 2018 the Pink Singers attended their 35th Pride in London parade. This year the theme of pride was #PrideMatters. 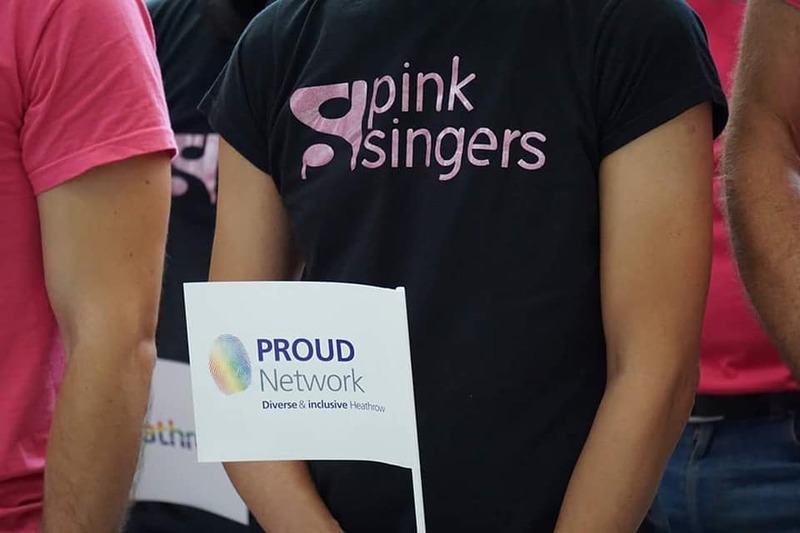 Pride in London is always a very special event for the Pink Singers and matters a great deal as it’s what brought our choir together all those years ago. This year like any other we walked the streets of our fabulous city, holding hands, with our heads held high and singing our favourite songs for the people of London. We were joined by Pinkies old and new, friends and partners and even some of the Pinkie babies in their best rainbow outfits. It was up, up and away for the Pink Singers as we participated in our first “Pride Events at Heathrow” on Sunday the first of July 2018. 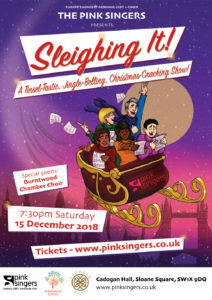 Around forty Pink Singers fastened their safety belts and boarded the Heathrow Express early that morning to take part in the event. After a quick briefing from the ground crew, our first set took off in Terminal Five at 11.45am. We had a great response from the surprised passengers in arrivals who found themselves serenaded with songs from our summer concert including This Is Me, Waiting for a Star to Fall, Rainy Days and Mondays, Freedom 90, Set Fire to the Rain, and Proud Mary. It was cabin doors to manual as we flew over to Terminal Four and delighted the unsuspecting arrivals there too. After that we returned our musical director to upright, folded our piano keyboard away and disembarked in an orderly fashion!